This recipe was inspired by a TVA podcast (one from long ago, about a chili cook-off). There was discussion about 'white chili', which was new to me. But, I was really interested because tomatoes can trigger food sensitivities in a lot of folks (I have had to eliminate them from my own diet before). When you do have to remove tomatoes from your diet, you come to realize how many food products, sauces, and condiments contain tomatoes in some form. So, the notion of chili with an alternative broth base got my creative juices flowing. I did some research, and found that most white chili recipes have ground turkey or chicken, along with chicken stock for the broth. Well, this can definitely be improved upon! I used a combination of cannellini beans with bulgur to satisfy the 'meaty' textural component. Then, the broth. Simply using veggie broth wasn't appealing to me, visually and also in terms of taste and texture. So, I created a thicker, creamy white broth that has some substance and gives this chili that "stick-to-your-ribs" quality we look for in a hearty stew. Another recipe checked off. (hurray!) Anyone ever have white chili, vegan or not? I love this idea for a white chili! I've never had one before, but I have heard of the concept and seen recipes. It's true that tomatoes are in so many different foods. I'm so excited that you're creating recipes for a new cookbook. Do you happen to use recipe testers for your cookbooks? If so, I'd love to test for you. Your 3 cookbooks are my go-tos because they are full of healthful, creative, and delicious recipes! I too love this idea. I haven't had a so-called "white chili", but I did come across a recipe for a tomato-less chili. It was such a help when years ago we needed to eliminate tomato (and citrus, and berries, and nuts, and...) from our diet due to our young son's allergies. Thank goodness he's outgrown most of them now--ever try vegan sans nuts and tomato? Ick! Ooh, yes. My mom made a fantastic white chili when I was growing up. She used ground chicken and lots of spices. It was really good! I'm really looking forward to yours...even though I have to wait for your cookbook which cannot come soon enough!! oooh you're working on another cookbook???!! I will buy it SOLELY for this White Chili recipe!!!! After all the inspiration you've provided the hosts of the TVP I'm really happy to hear we returned the favour. I also need to thank you for your white chocolate macadamia cookie recipe. I made it for my brother last week and he was ecstatic. They flew all the way to Florida and still impressed. This looks so good! I have fibromyalgia and have been trying (unsuccessfully) to cut out nightshades, which means no tomatoes. I can't wait for your new cookbook to come out so I can make this! I make white chili about once every ten days. It's vegan, of course, and it tastes soooo good, but I have trouble with the consistency. I feel like mine is too liquidy most of the time. Sometimes I'll throw in some TVP for the final minutes, to try and soak up some of the water, but I want to learn how to make my chili look like the one in your picture! I'm thinking the bulgur and the creamier broth must be key. I can't wait to learn how you did it. What a memory, woman! I mentioned the white chili almost a year and a half ago! I CANNOT WAIT to try your version. Woot! I can't wait to try this! 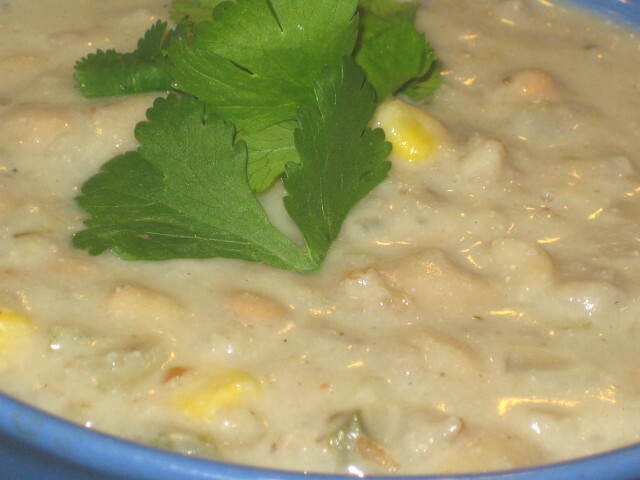 I had a white chili with chicken once years ago (pre-vegan, obviously), and I didn't care for it - but I really love the idea of a vegan white chili! That sounds infinitely more appealing. I LOVE white beans, and the idea to use bulgur is genius! I had never heard of white chili before... it sounds interesting and I really wonder what it tastes like... or if it tastes anything like regular chili. I'll have to wait for your book to come out! I had a favorite white chili prevegan, and then made a vegan version a couple of years ago. It's on my blog somewhere. I have had white chili before (back when I ate meat), and it was good - definitely different than tomato based chilis, but still yummy. I love the idea of a white chili, sometimes I want something different than a tomato-based chili. Will be looking forward to the recipe in your next book. Yum I love white chili! This looks great!